In the late 19th century, the port of Massawa, in Eritrea on the Red Sea, was a thriving, vibrant, multiethnic commercial hub. Red Sea Citizens tells the story of how Massawa rose to prominence as one of Northeast Africa's most important shipping centers. Jonathan Miran reconstructs the social, material, religious, and cultural history of this mercantile community in a period of sweeping change. 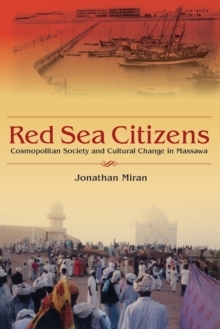 He shows how Massawa and its citizens benefited from migrations across the Indian Ocean, the Arabian peninsula, Egypt, and the African interior. Miran also notes the changes that took place in Massawa as traders did business and eventually settled. By revealing the dynamic processes at play, this book provides insight into the development of the Horn of Africa that extends beyond borders and boundaries, nations and nationalism.